You could throw this at people! For a kid growing up in Riga, one of the most exciting times of year was around the time of the First Real Snow – that first time in early winter when snow would come, and fall, and stay on the ground, and be repeatedly replenished with more, forming the permanent snow cover so typical of a winter in my region. That’s when I would pester my dad to dig up the toy sledge and go to the nearby park which featured several adequate slopes for hours and hours of sliding down and walking back up the hill, and then sliding down again. Best incidental exercise ever. I no longer own a sledge, though. And for the past three years I haven’t even seen any snow, because it doesn’t snow in Sydney. It does, however, occasionally hail – to an extent I have never experienced. 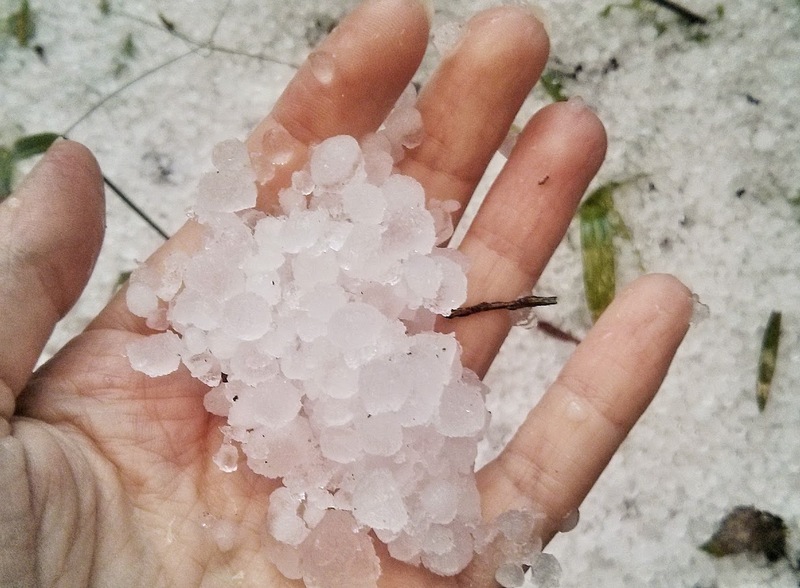 Not just a handful of hailstones that quickly melt, which is the usual scenario on summer days over in Latvia. This afternoon I saw an unprecedented volume of ice land in our front and back yards, and all over the street. And some of it is still there! So how does hail form? In all my excitement, I realised that I’m not quite sure how hailstones actually form. Sydney hailstorm can serve as a nice example here. This morning air temperature actually climbed in the high twenties – the weather was sunny and warm, with clear skies. However, as a thunderstorm approached, it brought with its heavy rainclouds a mass of cold air; the discrepancy of air temperature caused the warm air to rush upwards in strong currents, known as updrafts. When an updraft carries with itself a droplet of water, once it rises high enough into the atmosphere, it freezes, gets heavy and starts falling. If this ice ball gets caught in another updraft, it will meet with more water and grow another layer of ice, becoming larger with each toss through the air currents. Eventually, as the updrafts slow down, the hail stones pelt the ground. Hence, the larger the temperature discrepancy between the storm and the air temperature, the larger the clumps of ice will become, because you need very strong updrafts to carry ice upwards. Today’s hailstones weren’t too large, averaging around a centimetre or so, but the volume was impressive. By the time the storm passed, we had a good few centimetres of ground cover, which quickly melted in areas awash with water, such as the middle of the street, while staying put in areas where water wouldn’t melt them so quickly – like flowerbeds and other soil surfaces. There may not be quite enough of it in my backyard to bust out a sleigh or even to have a snowball fight, but it most certainly reminded me of snow. If you squint, it totally looks like it. I’m deeply impressed that Sydney pulled this off.